Though time orders are found all over the train order form spectrum, they nevertheless only come in two basic ways: the aforementioned waits/column waits, and the 'run late'. The latter, known officially as a Form E, does not require much explanation. The basic Form E states something like, "No 101 ENG 6017 RUN 4 HOURS LATE SACRAMETO TO MARTINEZ". An aside: back in the late 1960's, when the SP was trying to kill its passenger trains, a disgruntled old head conductor of #52 told me that he had received a MESSAGE to run one hour late into Los Angeles. He mumbled something about The Company not having the balls to put this into a (Form E) train order, and that The Company could go to hell. We arrived in LA on the money. Form E's can also be used to supersede Form E 's: "NO 101 ENG 6017 RUN 1 HOUR AND 10 MINUTES LATE ON ORDER NO 5". In this situation, 1'10" would be tacked on to the previous four hours, a danger for many of us who consider railroading as a refuge from higher math. Further complicating matters is that the run late, like the 'right over', only applies BETWEEN named points, so the Martinez Local theoretically has to expect No. 101 to depart on time, rather than 5'10" late. Oy! Form E train orders can also be expressed as a standard column wait (which is, given everything, is more staightforward), giving rise to the question, "Why have Form E's at all?" Answer: Because we do. At right is a column wait in its purest form (E). The Daylight is running a few minutes behind schedule, so the dispatcher has, in effect, created a new one. Number 90 and the Extra 4193 East may advance towards #99 based upon these times, but other eastbound trains must respect the timetable schedule. It is important to understand that a column wait does not modify train superiority, so that if you replace #99 with an Extra 4405 West, the 4405 will have to dive into the hole for #90 (which would now not need a copy of the order, since it is superior), but not for the Extra 4193 east, an inferior train. We've already discussed how to kick-up a train's superiority: by giving it a Form S-C or D 'right over' train order. Very often the column wait is contained in the Form S-C, as with Order #12, at right. Things can get very tricky when train order forms are combined, as in the case of Extra 4460 (one of two surviving SP 4-8-4's) West and #408. Remembering that 'right over' only gives superiority BETWEEN the first and last named points, the 4460 West must take the siding at Livermore in favor of #408. 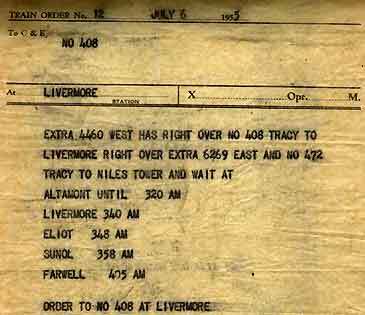 Notice that the last line says, "ORDER TO NO 408 AT LIVERMORE". This means that the Livermore operator must move the train order board into the 'stop' position for #408. Only after the train is stopped may order #12 be delivered to the C&E. In the same month, July 1955, SP's other surviving (in 2005) 4-8-4 was busy on the Altamont. Order number 48 represents another variation of the column wait. 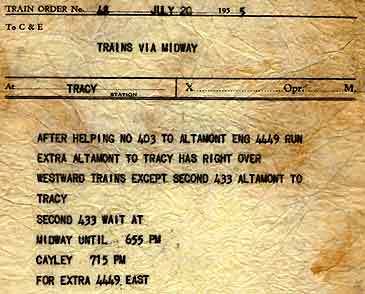 In this situation, Second 433 must wait for a specific train, the 4449, running light engine to Tracy for the barn, or possibly a second help (meaning a second day's pay for the crew). If Second 433 finds the 4449 patiently waiting in the siding at Midway, the column wait portion of the order is considered fulfilled, and train need not wait at Cayley until 7:15 - it may resume its timetable schedule. One final example: The column wait, below, is part of a standard variation of the Form G running order. It is an otherwise unremarkable order put out for a routine extra Coast Merchandise East (CME)... except for the engine (4-6-2 # 2475) and the date (December 30, 1957). Regular SP steam revenue freight operation had ceased nearly fourteen months before this order was cut. As far as anyone knows, this CME was the last steam-powered standard gauge revenue freight train run by the Southern Pacific. For more info, click on Order #41.